Vaughn Wilton Monroe (October 7, 1911 – May 21, 1973) was an American baritone singer, trumpeter, big band leader, actor, and businessman, most popular in the 1940s and 1950s. He has two stars on the Hollywood Walk of Fame; for recording and radio. Monroe was born in Akron, Ohio, United States, on October 7, 1911. He graduated from Jeannette High School in Pennsylvania in 1929, where he was Senior Class President and voted "Most Likely to Succeed." After graduation, he attended Carnegie Institute of Technology, where he was an active member of the Sigma Nu fraternity. Monroe attended New England Conservatory for one semester in 1935, studying voice with Clarence B. Shirley. Monroe formed his first orchestra in Boston in 1940 and became its principal vocalist. He began recording for RCA Victor's subsidiary Bluebird label. That same year, Monroe built The Meadows, a restaurant and nightclub on Massachusetts Route 9 in Framingham, Massachusetts, west of Boston. After he ceased performing he ran the club until his death in 1973. The summer of 1942 brought a 13-week engagement on radio, as Monroe and his orchestra had a summer replacement program for Blondie on CBS. Monroe hosted the Camel Caravan radio program from The Meadows, starting in 1946 and, during this time, was featured in a Camel cigarettes commercial. In 1952, Monroe and his orchestra had a weekly program on Saturday nights on NBC radio. Those programs originate on location from wherever the band happened to be touring. Each program featured a focus on a college in the United States. The Meadows burned to the ground in December 1980 after sitting shuttered and vacant for a number of years. Monroe was tall and handsome, which helped him as a band leader and singer, as well as in Hollywood. He was sometimes called "the Baritone with Muscles," "the Voice with Hair on its Chest," "Ol' Leather Tonsils," or "Leather Lungs". Monroe recorded extensively for RCA Victor until 1956, and his signature tune was "Racing With the Moon" (1941). It sold over one million copies by 1952, becoming Monroe's first million-seller, and was awarded a gold disc by the RIAA. 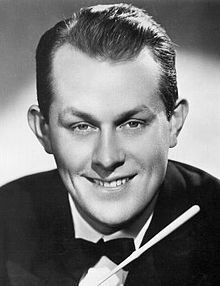 Among his other hits were "In the Still of the Night" (1939), "There I Go" (1941), "There I've Said It Again" (1945), "Let It Snow, Let It Snow, Let It Snow" (1946), "Ballerina" (1947), "Melody Time" (1948), "Riders in the Sky" (1949), "Someday (You'll Want Me To Want You)" (1949), "Sound Off" (1951), and "In the Middle of the House" (1956). He also turned down the chance to record "Rudolph the Red-Nosed Reindeer". Monroe's orchestra had a number of excellent musicians including future jazz guitar great Bucky Pizzarelli. While their musical focus was largely romantic ballads, in person the band had a fiercely swinging side only occasionally captured on record. In ballrooms, Monroe often reserved the final set of the evening for unrestrained, swinging music. Movies also beckoned, although he did not pursue it with vigor. Monroe appeared in Meet the People (1944), Carnegie Hall (1947), Singing Guns (1950), and Toughest Man in Arizona (1952). He co-authored The Adventures of Mr. Putt Putt (1949), a children's book about airplanes and flying. Monroe as a guest star in a 1962 Bonanza episode. He hosted The Vaughn Monroe Show on CBS Television (1950–51, 1954–55) and appeared on Bonanza, The Mike Douglas Show, The Ed Sullivan Show, Texaco Star Theatre, The Jackie Gleason Show, The Tonight Show Starring Johnny Carson, and American Bandstand. He was a major stockholder in RCA and appeared in print ads and television commercials for the company's TV and audio products. After leaving the performing end of show business, he remained with RCA for many years as a TV spokesperson, executive, and talent scout. In the latter capacity, he helped give Neil Sedaka, among others, his first major exposure. He was awarded two stars on the Hollywood Walk of Fame, one for recording at 1600 Vine Street and one for radio at 1755 Vine Street in Hollywood, California. Monroe married Marian Baughman, April 2, 1940, in Jeannette, Pennsylvania, where they had met as high school students. They did not date in high school but became romantically inclined toward each other when their paths crossed again in New York City, twelve years after graduation. They came back to Jeannette for their wedding. They had two children: Candace (born 1941) and Christina (born 1944). They remained married until Vaughn's death in 1973. Monroe was a licensed pilot and often flew himself to tour dates in his own Lockheed 12A airplane. Monroe died on May 21, 1973 at Martin County Memorial Hospital in Florida, shortly after having stomach surgery for a bleeding ulcer. He was buried in Fernhill Memorial Gardens and Mausoleum in Stuart, Florida. APeaked at #2 in Billboard Country singles. ^ a b "Vaughn Monroe Dies At 62". United Press International. May 22, 1973. Retrieved 2010-10-08. ^ "Camel Cigarette Commercials, 16mm Transfers Reel # 8. [Part 2] : Internet Archive : Commercial starts at 1.48". Archive.org. 2001-03-10. Retrieved 2014-08-20. ^ "Radio Spotlight". The La Crosse Tribune. January 19, 1952. p. 7. Retrieved August 14, 2015 – via Newspapers.com. ^ "Vaughn Monroe: Biography". Vaughn Monroe Appreciation Society Presents. Retrieved 15 August 2015. ^ Murrells, Joseph (1978). The Book of Golden Discs (2nd ed.). London: Barrie and Jenkins Ltd. p. 25. ISBN 0-214-20512-6. ^ a b "High school auditorium to be named for Jeannette grad, Big Band star Vaughn Monroe". TribLIVE. Retrieved 2014-08-20. ^ a b "Vaughn Monroe "There, I've Said It Again"". Big Band Library. Retrieved 2014-08-20. ^ "Vaughn Monroe, 62, Dies; Singer and Bandleader; Headliner of An Era". New York Times. May 22, 1973. Archived from the original on 2012-11-04. Retrieved 2010-10-08. Wikimedia Commons has media related to Vaughn Monroe.